With quotations by Pope first followed by others in alphabetical order of the person making the quote. The first note is the location where I found the quote and the second is the footnote in that work which contains more background information on the quote. JP to Lucretia Pope, Sep 17 1838, JP Papers, USMA. Pope describing his visit to Pittsburgh Landing after the Battle of Shilon and the clay so deep that there was danger every moment of having his boots being sucked off his feet. Pope replying to Brig Gen Robert Schenk about what to do in case the enemy was found to do to dispute their advance. Kearney chafing under McClellan’s inactivity. Lee in a letter to Jackson. 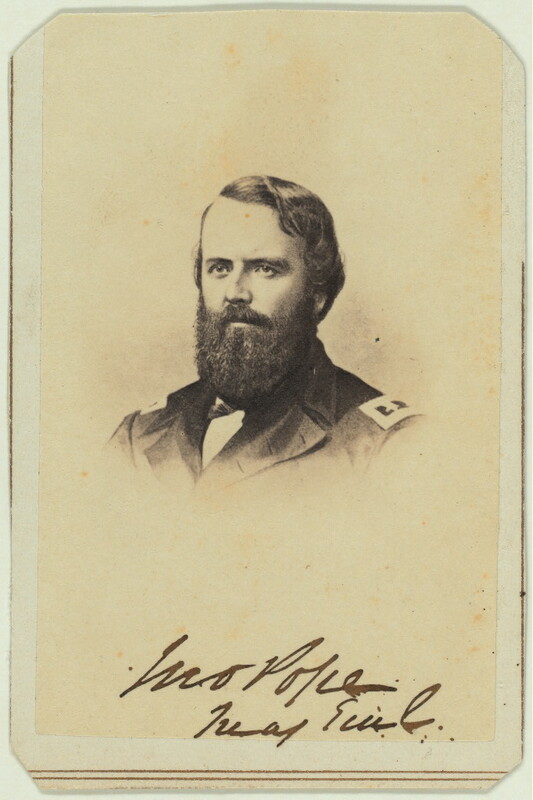 “paltry young man who wanted to teach me the art of war” George B. McClellan, George B.
Henry Clay McNeil to his sister, Nov 29 1862, McNeil Papers, Sioux City Public Museum, Sioux City Iowa. Meade reacting to a letter that Pope wrote that appeared in newspapers after the Battle of Monterry which was very complimentary of him. John Palmer to wife, Mar 9, 1862, John M. Palmer II Papers, ISHL.